All hunters need to take immediate action to oppose Senate Bill 1487. SB 1487 is sitting on Gov. Jerry Brown’s desk – so your time to ACT is now. Contact Gov. Brown today using SCI’s Action Center and ask him to veto SB 1487. This bill, if it becomes law, will prevent hunters from importing and possessing any of the named African species, including parts and products, lawfully harvested in Africa. This bill targets the Big Five (other than the Cape buffalo) and an additional six species – some of which are neither listed on the Endangered Species Act’s endangered/threatened lists or CITES Appendices I or II. Lastly, this bill attempts to circumvent the ESA’s preemption of any state law that bans what the ESA permits (e.g., importation of certain species). This bill undermines the U.S. Fish and Wildlife Service’s attempts to foster conservation through sustainable use hunting in Africa. For species listed under the ESA, the FWS already determines when their importation (and possession) in the United States benefits the conservation of the species. While Gov. Brown considers whether to sign the bill into law, SCI urges all members who reside in or do business in California to contact the Governor’s office using SCI’s Action Center and ask him to veto SB 1487. 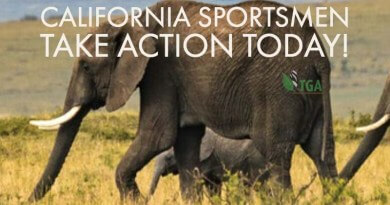 The apparent goal of the legislation is to discourage residents of California from hunting these species in Africa. Losing the ability to import and possess their trophies will discourage Californians from hunting in Africa. Should that occur, African wildlife and rural communities will lose a vital stream of funding for both conservation of wildlife and support for the local communities. Additionally, without the money brought in by hunters, the range countries and professional hunting guides will lose funds for on-the-ground anti-poaching efforts. Contact Gov. Brown today and ask him to veto SB 1487!